Want to improve your hand-eye coordination, teamwork, and mental strength? You could also join the People’s Liberation Army in Hong Kong. 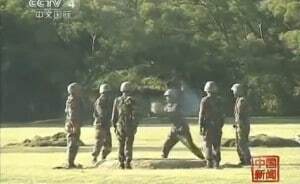 During an exhibition for Chief Executive Sir Donald Tsang, soldiers tossed a bag of explosives around, and then threw it down a hole right before it exploded. You could say the soldiers were 镇定自若(zhèn dìng zì ruò). Here are examples of how 镇定自若 (zhèn dìng zì ruò) is used by real live Chinese people. Hope you enjoy this chengyu!